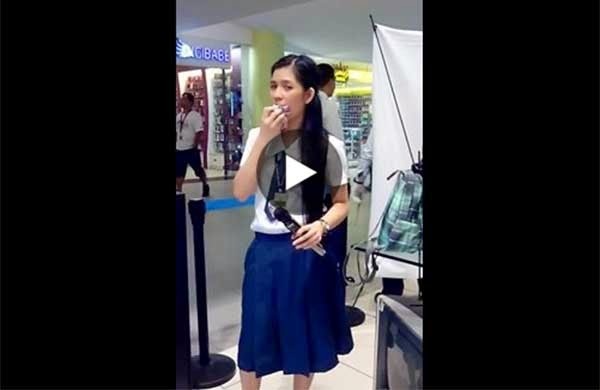 Jade Hipe, a student from San Pedro College of Davao, became an instant celebrity after a video showing her singing Chaka Khan's "Through The Fire" had gone viral online. In an interview with ABS-CBN News, the 21-year-old singer, who hails from Mawab town in the province of Compostela Valley, said she did not expect to become popular on social media. Hipe shared that it was routinary for her to drop by at the nearby Gaisano Mall with a friend and grab the mic at the Magic Sing outlet during free time. Her friend is the one taking her videos, she said in a Facebook post. The internet sensation, whose Facebook account is Jade Marchaprilmayjune Hipe, said she usually sings her problems away. She had no knowledge whatsoever that singing will be her ticket to stardom. "What I am experiencing now is truly a very big blessing that I've never expected would come my way. Indeed, God is so good. Ni sa hinagap, hindi ko inakalang makakarating sa pages nina KATHRYN BERNARDO, VHONG NAVARRO, at JAMICH ang video ko," she posted on Facebook. "I am so thankful and lucky na pinahintulutan ni God na mangyari ito sakin. Maraming salamat po and God bless us all." Hipe was not entirely welcomed with a red carpet though as there were some who bashed her for looking masungit (cranky) while singing. The 3rd-year A.B. English student explained that at the time, she was forced by her pal to sing "Through The Fire" after 25 songs. Despite being already late for school for one hour, she gave in to her friend's demand and sang the song. Her viral video, which is titled "Pinay Videoke Talent" on YouTube, already received over 215,000 hits. It also garnered 4,157 shares and more than 15,000 likes on Facebook as of this posting. In her recent Facebook post, Hipe revealed that she is going to have a collaboration with music experts and professionals for her upcoming music video.